As fishing has always been a major Japanese industry, the Akita, with its webbed feet and thick water-resistant coat, readily became the fishermen's workmate. 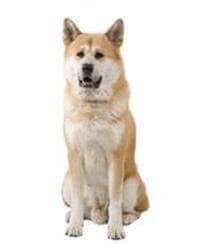 Akitas were then used as cattle dogs, seeing-eye dogs for the blind, sled pullers and police dogs. They were also utilised as ‘babysitters’ looking after children while their mothers worked in the rice fields. These proud dogs often live to eight years of age, but Akitas treated correctly and fed the proper nutrition can live up to 10 - 12 years.